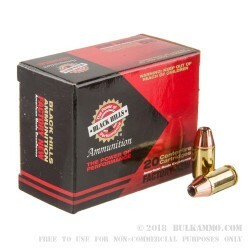 Blacks Hills Ammunition is revered by U.S. military sharpshooters and numerous law enforcement agencies for its undying quality and top tier performance! Since 1981, the South Dakota based company has been known for precision reloads as well as high grade, first-run ammo. Each Black Hills load is well-researched, tested, and refined before introduction as a finished product in order to ensure that shooters get the highest benefits available. 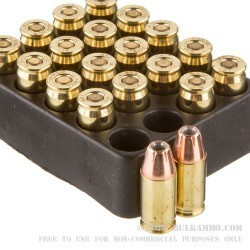 As such, these .380 Auto cartridges are an excellent choice for self-defense and utilize all factory-new components. This includes reloadable brass casings, non-corrosive Boxer primers, and jacketed hollow-point (JHP) bullets of uniform construction. The 90 grain JHP that Black Hills chose for this load has a sloped ogive and flat tip for smooth feeding and blunt entry respectively. 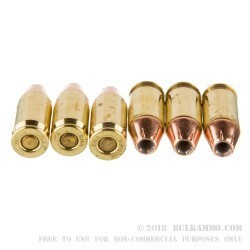 90 grains is a common .380 ACP weight and matches the most common practice loads. Precise jacket skiving border the bullet's hollow cavity and promote dependable expansion upon impact with a threat. As the projectile penetrates into a target, it will increase in diameter, slow its speeds, and yaw in direction. This translates to a bullet that deposits all of its energy into vital organs in order to achieve a quick drop without the risk of lethal over-penetration.